Tonight I nipped out to a party to celebrate 50 issues, and 10 years, of "Style Birmingham" Magazine. And the great thing about a party? It's a fab chance to rock a new frock. I'm wearing the ink rose midi dress from Warehouse (£59) and LK Bennett zebra print shoes - plus a neon glow. The best flat, comfortable, boots out! A few weeks ago I treated myself to these grey suede boots from Zara. I'm still not quite sure what it was about them that appealed to me but I really liked them. Maybe it's because I haven't seen them around that much so they felt quite fresh - but I suspect in reality that it was the grey that got me. Plus the white soles - and the fact that I can walk in them. Try as I might, I can't find them on the site but I've come to realise that I'm quite often rubbish at finding things online after I've bought them. If anyone likes them enough to hunt them down (with success) do let me know! I appear to have a cow on my shoulder! We all know that the world was inundated with floral midi dresses during the summer - and it hasn't stopped there. They are everywhere but it's only really this Dorothy Perkins floral midi dress (was £45 now £34.20) that has made me want to commit. There are some great ones around and I'll share my favourites in another post but what sold this one to me was a) the colours b) the fabric (it feels like silk, not like nylon) c) the band around the neck which has that sporty nod to it and which stops it from feeling too "Grandma" like d) the fit - it's not like a nightie (or a maternity dress) to wear, which is always my slight concern. So you know how there was this whole slip thing going on in the summer? Well it's continued on into the autumn too. Slip dresses are great because it's easy enough to layer something underneath them, such as this black ribbed turtleneck from H&M (£24.99). I love a turtleneck, in fact I think a black ribbed turtleneck was the first thing that I ever bought from Jigsaw when I was 21. And as you get older, they're great because there's less for your chins to rest on, compared to a polo neck :) Equally a chunkier jumper can be layered over the top of them, so they're pretty versatile little numbers. Now, I currently have my eye on this Zara silk feel batik dress (£49.99). I first saw a couple of weeks ago and I had another look last week. Next week I might actually try it on. I like the idea of it with the black turtleneck underneath it on Christmas day. A bit dressy but not too dressy and with a pair of ankle boots or biker boots, it would be good for everyday too. Then when the spring comes I can wear it with a white t-shirt underneath, Stans and off we go again into another season with it. Another option that might be a little easier to imagine wearing, is this M&S lace trim skirt (£35 but with code SEPT16A12 there's a 20 per cent discount). Again it would work with the black turtleneck, a chunkier short cream jumper, a blouse, or a cami top for an evening out. I think that I will be wearing mine with a denim shirt and leather jacket rather than more dressed up - but we'll see. And then for those who prefer the idea of something "slip like" on the top half rather than as a dress or skirt, there's this M&S sleeveless lace trim camisole top (£22.50 which again has a 20 per cent discount with the same code). It could be worn with boyfriend jeans, a white t-shirt and chunky loafers for a weekend feel, maybe with a chunky cardi thrown over. 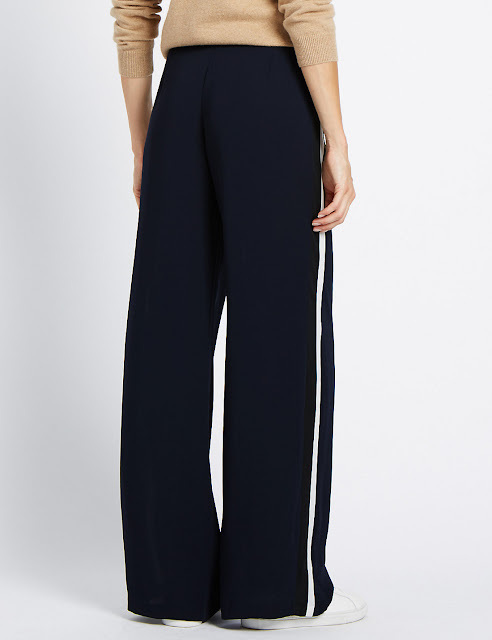 Or I fancy it with smarter navy tapered trousers, ankle boots and a navy t-shirt. So, will anyone be slip sliding their way into the Autumn with me in something of the slip variety? OK so I'll hold my hands up before anyone else comments. Those of you with eagle eyes will have noticed that there is some white vest on show in these photographs. In my defence it was cold this morning and as I hadn't worn the top before I didn't know how everything would hang together (or hang out?) Anyway, badly, would seem to be the answer. Now I've run, showered, and replaced the vest with a blue one I could re-do the photos but hec, I'm off to see Bridget Jones' Baby tonight and there's the dinner to be cooked, another school run to do and a gym trip to do before then, so white flashes of vest it is. Will you forgive me?! 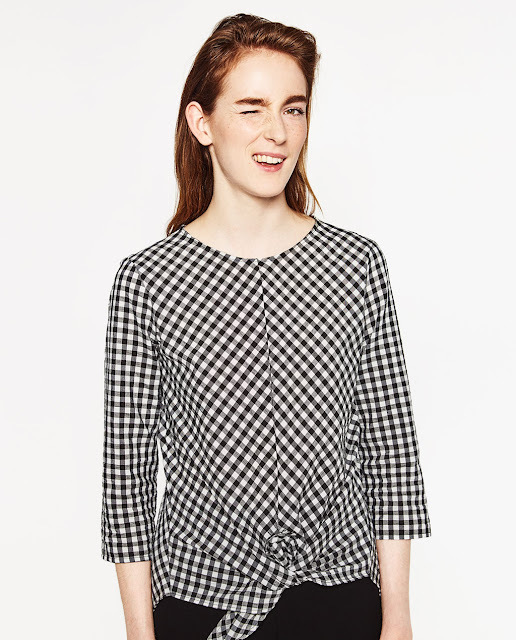 I bought this Zara poplin top with knot (£29.99) a few weeks ago now but it's still available for anyone who likes it. It's one of those tops that falls into the "accessible fashion" category. It's easy to wear (unlike off the shoulder tops which ping all over the place and as soon as you move your arms your armpits get cut in half) it goes with lots, it's a simple style so it shouldn't date too quickly, plus when it gets chilly, I can layer a long sleeved top underneath. Staying with the knot theme, there's also this striped top with knot from Zara, also £29.99. Blue and white stripes are still everywhere so this is a good option for anyone who wants to update their twingy, pingy, striped off the shoulder tops which dominated this summer. 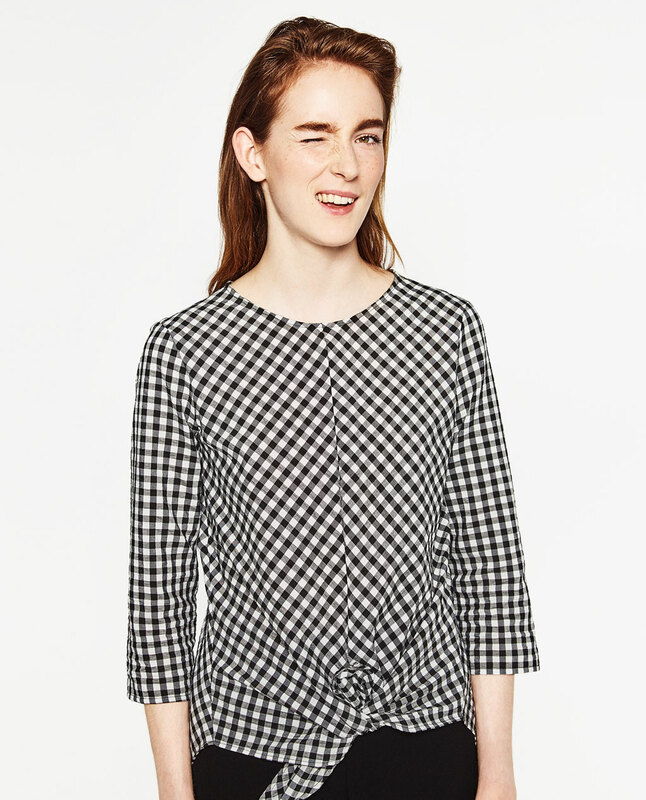 Or for something a little different, there's this gingham blouse still with a knot and also from Zara, which is £25.99. So, hopefully that's an easy update idea for your A/W wardrobe. 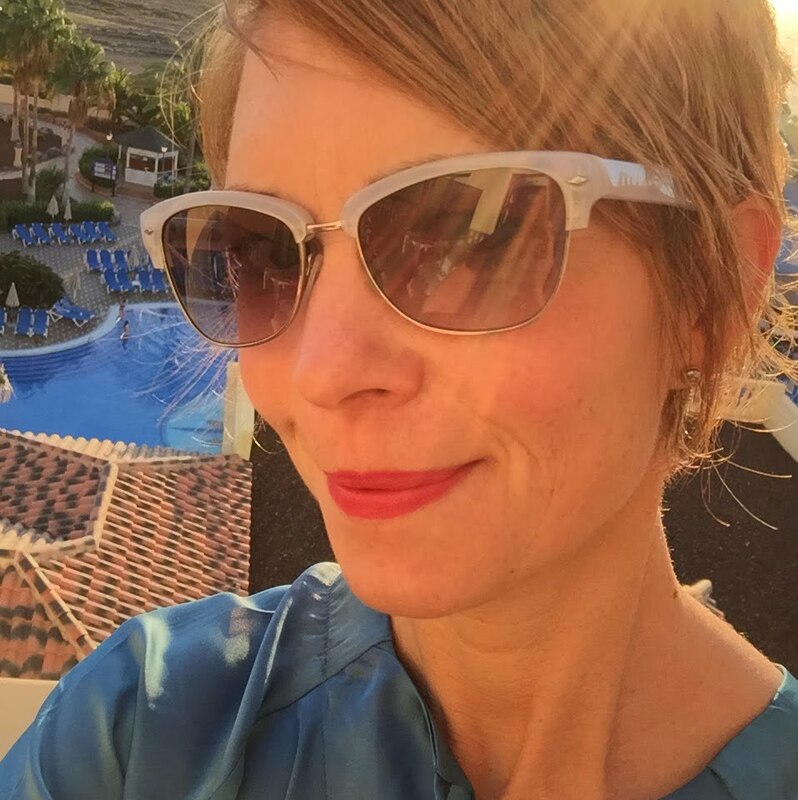 Hope that you are all having a super weekend! ps. I've now seen Bridget Jones' Baby and it was brilliant. If you're not sure, do go and see it. It's so funny. I haven't laughed so much in ages! As with each new season there are lots of different trends on the scene but as we all know, the quickest, most cost effective and most workable way to update a wardrobe is not to buy a "look" or a "trend" from head to toe - but to tap into a few pieces in the shape and style of the season and which work with what you own already. I've never had a side stripe trouser before (well at least I don't remember them being around in the 80's but please correct me if I'm wrong!) and despite it only being a small detail, it's quite refreshing plus unlike some trends and looks, it's really accessible. Suddenly all of those plain tops and crew knits have been given a new lease of life. 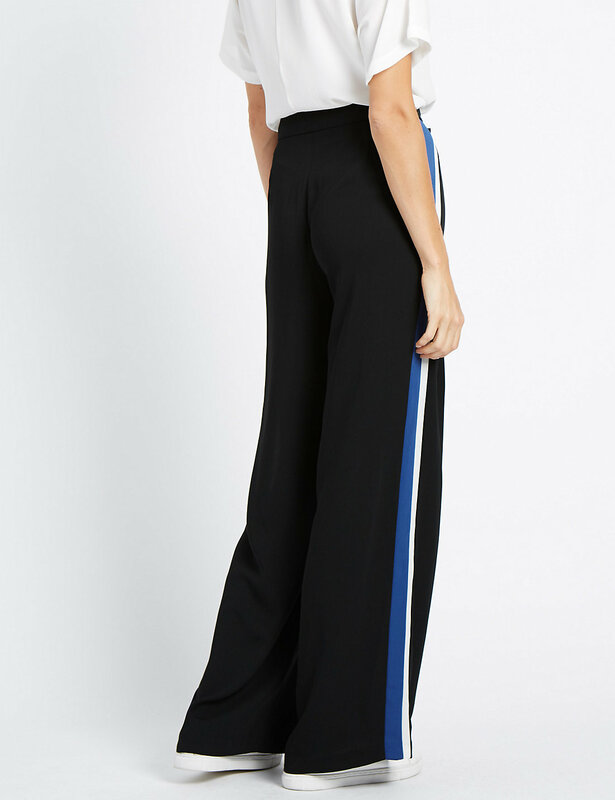 For those who might be interested, these trousers also come in black with a sky blue stripe. On another note I just really wanted to thank you all for your good luck wishes and messages that you sent before I did the Great North Run. They meant a lot and when I found the going tough (about miles 2 to 13.1!) they kept me going. So a huge thank you for taking the time out of your busy day to get in touch. Also huge thanks to the locals who sprayed hosepipes over us and offered ice pops - only about 20 minutes or so after the end of the race did I find the one that I'd shoved down my bra. Oh and apologies to the family for taking the coke that they were offering, only to realise that it was Newcastle Brown Ale and throwing it away. I think that it might have just tipped me over the edge. *since drafting the first part of the post, I wore the trousers on the school run where I got caught in the hugest rain/thunderstorm going. BUT I'm glad to report that not only do the trousers roll up to thigh height quite nicely but when they roll back down they're not in the slightest bit creased and they dry really quickly. A bonus if ever there was one. This is just a quickie because in a couple of hours we're heading up to Newcastle as tomorrow I'm running in the Great North Run. Sad as I am, I'm really excited. I love the atmosphere, the crowds, listening to the bands as I run round, eating M&S chocolate flapjack and I can't wait to see the Red Arrows fly over. Plus I'll get to see the sea, which is always exciting for someone who has always lived in the middle of the country. I'm making it sounds like a walk in the park aren't I? Did I mention that there is a the little matter of running 13 miles involved? Oh well, I deal with that only when I have to! So I hope that everyone has had a good return to school/work/traffic jams after the summer holiday. I had a Style Event on Thursday night so on Wednesday I hit the stores with glee, scooping up armfuls of clothes in M&S (a current favourite for this season), Zara (ditto), H&M, New Look, Warehouse, Oasis, Mango and Dune. I think that I've got a fairly good handle on what's out there at the moment and I'll bring you some of my favourite pieces a bit further down the line. But for now I wanted to talk about this boyfriend blazer (£45) which I saw on Alex of The Frugality on a huge photo on Oasis and which she was wearing as part of her Autumn by Alex campaign with them. 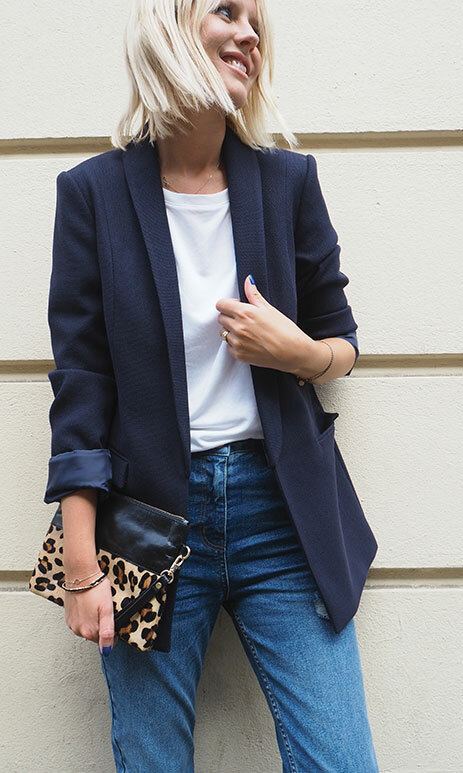 I'd identified a while ago that a boyfriend blazer was missing from my wardrobe and I'd taken a look at some but I wasn't feeling the love enough. Then when I saw (and tried on) this one which was navy (big plus), lined (big plus), £45 (super big plus) and felt as good as far more expensive makes (super, super big plus) - I was smitten. I'd always been concerned that a boyfriend blazer would shorten my legs but on first glance I don't think that as look as though I've shrunk too much and I'm looking forward to seeing how I can wear it. I think that it's just what my wardrobe needed to give at a new lease of life for the Autumn. Has else made a recent purchase for the Autumn which has turned things around and shaken things up a little? I would love to hear about them and in the meantime, have a super weekend.